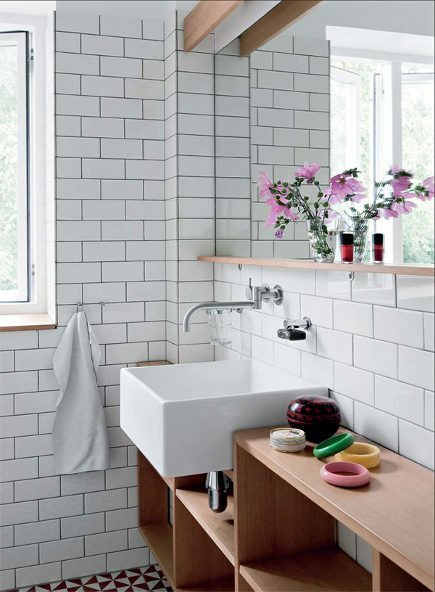 For a modern look, it’s bathroom vanity shelves instead of cabinets. One advantage of choosing a vessel sink is flexibility. If that sounds like a generalization it’s an important one. Traditional bathroom vanities are designed to have the sink bowl recessed and the rim flush with the top of the counter. In contrast, contemporary vessel sinks tend to sit right on top of a flat surface with their full depth exposed. Since many vanities are standard height but the height of vessel sinks vary, bathroom vanity shelves are a logical alternative. For a handsome powder room [top] where space is tight, a relatively shallow, square vessel sink (about 6-inches deep) sits right on the vanity shelf and up against the planked wall. And since vessel sinks are normally (though not always) paired with wall mounted faucets, there is no need to allow for plumbing in the back. This sink, set on an extra thick slab of oak, is also attached to the wall and caulked. A second wood slab below it provides storage space. Without a cabinet, the sink-drain plumbing is exposed though that’s not always visible since this shelf is fairly deep. Here, a garden seat pushed in below the shelf screen the drainpipe out of the photo. A large vessel sink can be cantilevered over a narrow shelf and integrated into a larger storage structure. Since the plumbing is wall-mounted, the sink is pushed neatly against the tile wall. The exposed drain pipe has a finished housing that essentially becomes part of the overall design. And by integrating the sink into the wall of low shelving, the bathroom becomes very functional since toiletries and other necessities are easily at hand. One additional aspect of vessel sinks is how high or low they are mounted and how that affects use. One powder room sink appears to be higher than the other one. For me, at 5’7”, a sink rim at 35 to 37-inches off the floor is optimal (since it requires less bending over) though that measurement might be uncomfortably high for someone shorter. What’s great is to have the choice to adjust the height and integrate it into the overall bath design so fixtures line up harmoniously within the space. Always love wall-mounted taps – and the simple light baffle in the second picture. Love the look of open vanities and shelving in bathrooms, but hate their dust collecting tendencies. Plus, I need to use my vanity store stuff that isn’t necessarily display-worthy. Classic case of form vs function for me. I think the trick to a shelf vanity over a cabinet relates to storage. We all have unsightly bathroom supplies, although perhaps not in a PR. 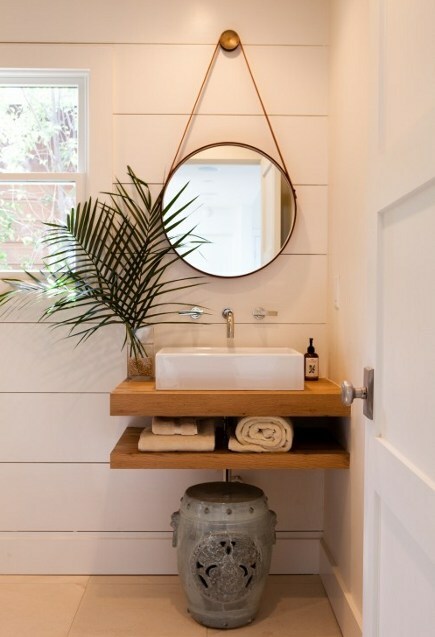 If you have a linen closet in the bathroom you can probably manage with a shelf vanity. But in many (most?) bathrooms the need for hidden storage dictates a cabinet vanity. I love my shelf/open vanity, but I’m lucky enough to have a well positioned and large linen closet for all my “stuff”. Plus a recessed medicine cabinet. I personally do not care for traditional vanities in bathrooms. They are way too low for me and I hate the kneeling to look for things and the wasted storage. I do like the Robern drawer vanities but — for me — that’s where it ends. We bought a shallow cabinet for our master plus we have shelves in our linen closet for the overflow. The bathroom is probably the last place where changes will occur but I can see them shifting. As you say, a bath should have a closet and seems to be moving more towards “room” features than just the utility box concept that endured for a whole century.